I met (what I think) is the man I am supposed to be with. I know you are asking, Jeigh, how do you know this? So, let me enlighten you. When I saw him, my heart skipped a beat. I had those butterflies in my stomach and of course I felt like I was sixteen again. A super huge Kool-Aid smile was plastered on my face. Everything he spoke sounded so heavenly. I got that feeling that most people talk about; that “love at first sight” feeling! I asked myself, “How could that be? I don’t know anything about this guy!” I wanted to get to know him, had to get to know him. He was tall, attractive and most of all, he had a wide-spread vocabulary. Once we were engaged into conversation, I realized that he was in a relationship, (I have much admiration for him, he isn't a liar) and he was moving back to his hometown. Right then, I knew, timing was all wrong! Why couldn't we have met when he was single or moving to my city? Yeah, this would be my luck to meet a guy that was “off” limits! We conversed for a more few hours. We did exchange contact information, but we both knew that nothing more could take place. After this chance meeting, I believe I will find that “right” guy. I know exactly what to look for in my next candidate! I am being optimistic, which is something that I haven’t been in a while! 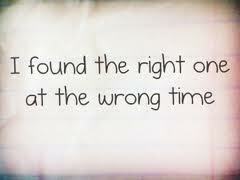 Therefore, we shall see if I meet the "Right One at the Right Time!" Please tell me I am not alone; have you ever had an encounter like this before? Must be in the water! I met someone at bible study last year.... we spoke, I liked her, she eventually showed interest in me... she is what I have been looking for in a woman. I travel a lot for work. we were talking she met someone else. :( they broke up :) she wanted to go out again..... we have, and now it is a waiting game of me trying to stay on her mind, with out pushing too hard because the other guy hurt her bad. so she's been pretty closed off and stand offish. I like her a lot, she likes me ( I can tell) but still keeps me at arms length, right woman....... not the right time...... I just hope I can hold on, while she comes around...... any advice? Corey, you will have to give a little time to rebuild that self confidence! While you are doing that, call her, invite her out; just let her know you are very interested and willing to take it slow! Good luck!